We like to showcase new and exciting client work through the BLOG however here at a glance are some website design portfolio samples. Wright Investors Service is recognized as an outstanding quality provider of investment and financial services worldwide in the markets they serve. We worked to merge all four of their verticals from separate sites – Trust Investment Services, Institutional Asset Management, Private Asset Management, and their Research database – into one single site. This was a MAJOR upgrade as a redesign had not been done in many, many years. Peggy Chappell holds an B.A. degree from Smith College, trained as a teacher, a MSW from the University of North Carolina at Chapel Hill , also a post masters Social Work Clinical Fellowship from the Yale Child Study Center. In addition to individual coaching, Peggy offers support groups for those in the caregiver role, workshops for parents and teachers, and consultations to organizations. We created her new website, logo, custom graphics including training so she could begin to manage her own web presence. We also edited her beautiful macro photography work. Bradley and Wall is a family owned treasure and located in Madison, CT. They serve delicious Italian cuisine and have been recognized as the Shoreline Times’ “Best Deli.” They serve only the highest quality foods prepared by hand and always served fresh. They are using their site to Tweet daily specials and they always draw a big crowd. MJW EA & Company LLC provides year-round tax and bookkeeping services for both the individual and small businesses. This is the second website we’ve created for them, this is an upgrade to HTML5 and a mobile responsive design while including some additional functionality including membership and file sharing. The Guilford Land Conservation Trust is a non-profit, all volunteer group, founded in 1965, devoted to conserving open space and natural resources in Guilford, Connecticut for public benefit. This marks the third site we have developed with them over the years. As new technology and new board members change so do their requirements for managing their total web presence. 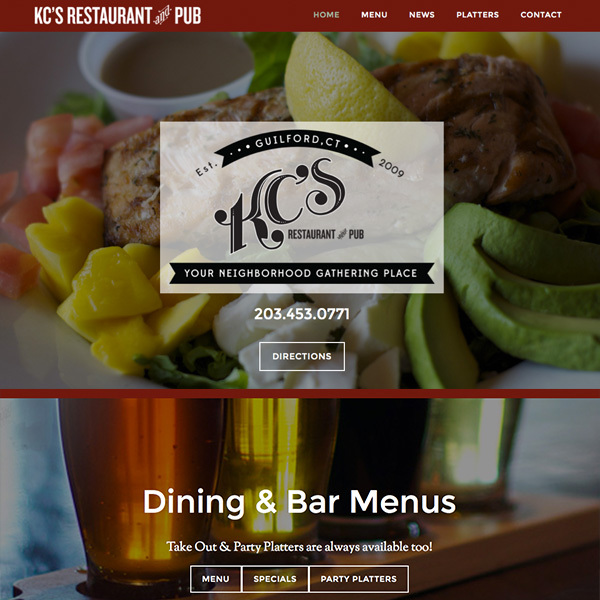 KC’s Restaurant and Pub, located in Guilford, CT and is known for featuring craft beers while being a traditional neighborhood gathering place. With one of the Connecticut shoreline’s largest selections of craft beers on rotation, delicious food, and a relaxing comfortable atmosphere, KC’s Pub is a local family favorite. Over time we have created 2 websites with them and done lots of training, custom graphics, logos and more. This new logo is done by designer Brittany Whiteman. Touchdown Communities is a nonprofit started by Tim Downes. TDC offers living and work solutions for adults with Autism in New Jersey and beyond. It was a privilege to be part of the launch of their program and website. Logos, business cards and graphics for print and digital mailings were also provided. We provide services for the technical maintenance that the website will need but they are managing their own content and all editorial site work in house. Doctors’ Pediatric has been dedicated to serving the children of Connecticut since 1954. Doctors’ Pediatric is a well-known practice serving Greater Connecticut patients and families. Their new site was built with WordPress on the Genesis Framework. Their old site had become stagnant, broken, and obsolete. Now they have the ability to manage their own content. This site is mobile and tablet responsive, search engine optimized, and affords their clients/families the ability to interact with them online very easily. System Office Design is a New Jersey based business guided by owner and hands on project manager Deb Hoffman. She is a seasoned office space planning, design, and furniture consultant with over 20 years of experience in the commercial and healthcare industries. Her new site is also HTLM5, built on The Genesis Framework with mobile responsive design with a strong call to action. RAT Race Timing LLC is a running partnership of Kerry Arsenault and Jerry Turk, who bring their passion for sport and experience of competitive events as both participants and organizers, to event timing. Their website does A LOT, so do they… check it out!